“What goes up, must come down! 100, 200, 300, 400, 500, 600, 700, 800, 900, 1000, Ding! Yester California Adventure is no ordinary carnival, and Maliboomer is no ordinary high-striker game. Here, there are three towers; they’re ten times the height of a typical high-striker game; and you get to be the puck! Actually, Maliboomer is not really a high-striker game—but it’s themed to look like one. And not just any high-striker game, but a space-themed one. Okay, it really doesn’t look much like a high-striker game. 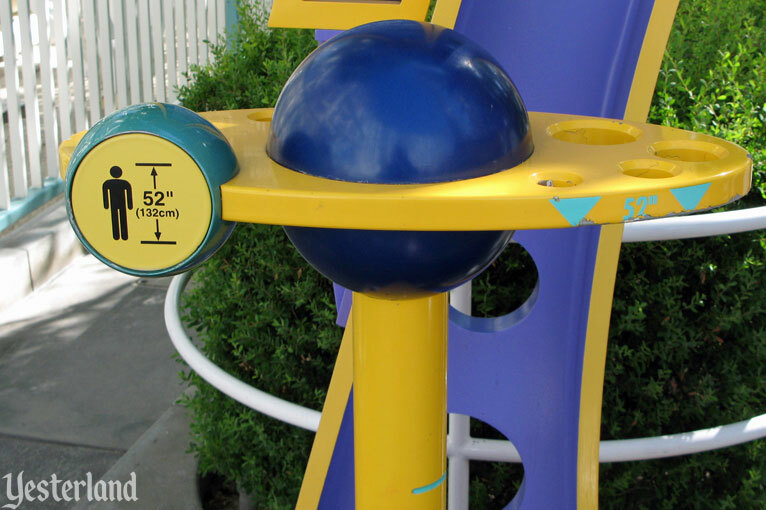 It looks like an S&S Space Shot attraction purchased from ride manufacturer S&S Worldwide, Inc. Because that’s exactly what it is. There are a bunch of warnings. 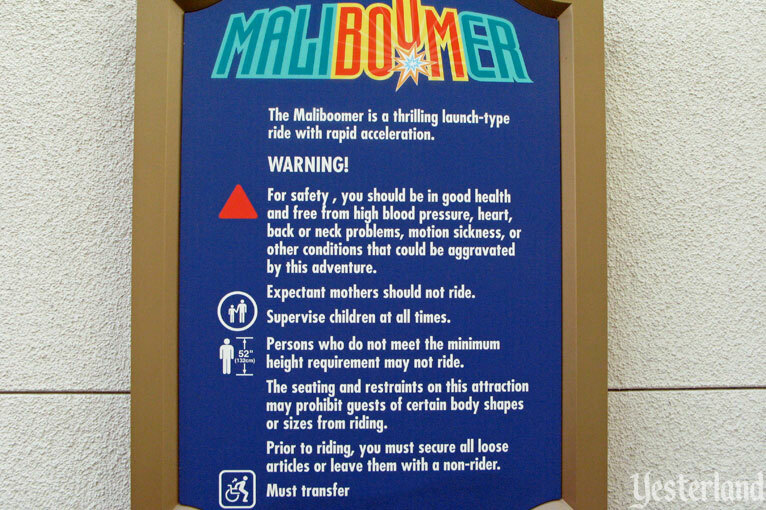 Here’s one more: Don’t a eat a Malibu-Rito right before riding Maliboomer. Any children must be tall children. 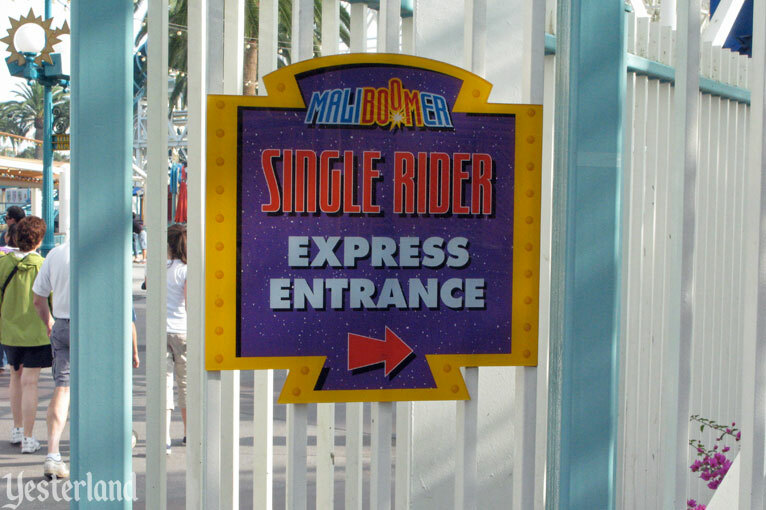 If everyone you’re with is too small (or too chicken), you can save time with the single rider line. The seating is in groups of four, so there’s often an empty seat when another party consists of an odd number of guests. 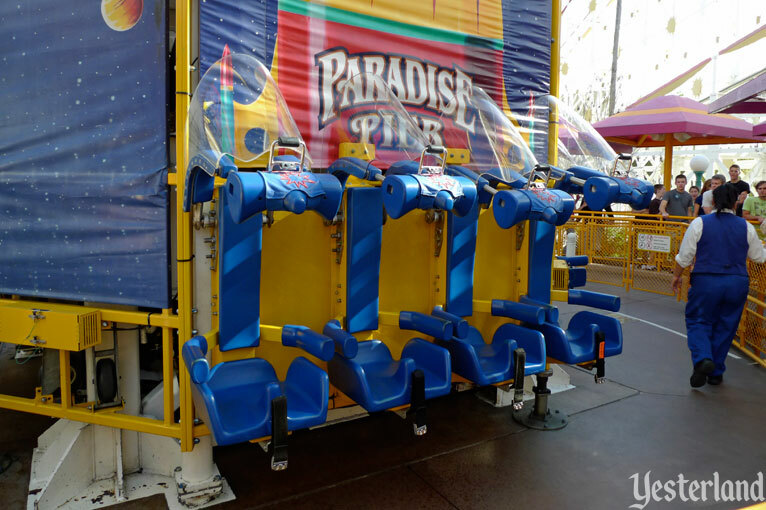 Here’s something that you normally don’t see on Space Shot rides: each seat has a plexiglass shield for each rider’s head. The shield is not for the protection of the riders. It’s to protect people outside the park from having to hear loud screams. Sixteen seats surround each tower. Try to get a seat that faces into the park. 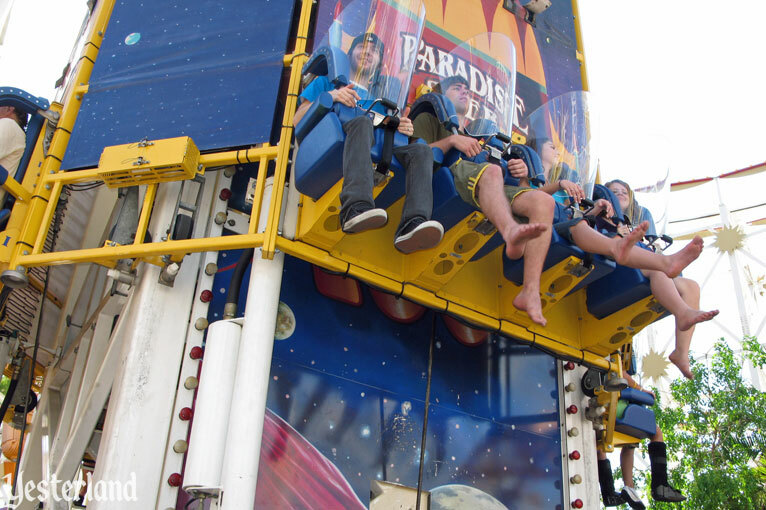 You might get a great view if the ride doesn’t drain you of the ability to do anything but scream. Ready? A high-powered, compressed-air system launches you straight up with a force of 4 Gs. The trip to the top is short, but intense. You reached the top. Remember, this is supposed to be a high-striker game—thus the ring of the bell. This ride has its ups and downs. You now head downward at freefall speed. You feel weightless in your seat. Before you get to the bottom, you find yourself heading upward again, but not as far. Then it’s down again. Up again. Down again. It’s sort of like bouncing. Less than a minute after your launch, you’re already back on the ground exiting from your seat. Even though you made it to the top and the bell rang, you don’t get a brightly colored plush toy. Sorry. 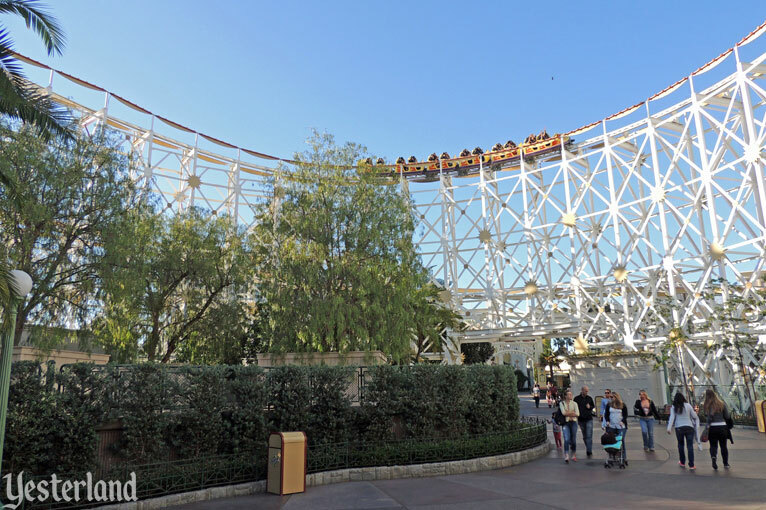 Maliboomer was one of the original attractions when Disney’s California Adventure opened in February 2001—and, at 180 feet, the tallest attraction in the new park. 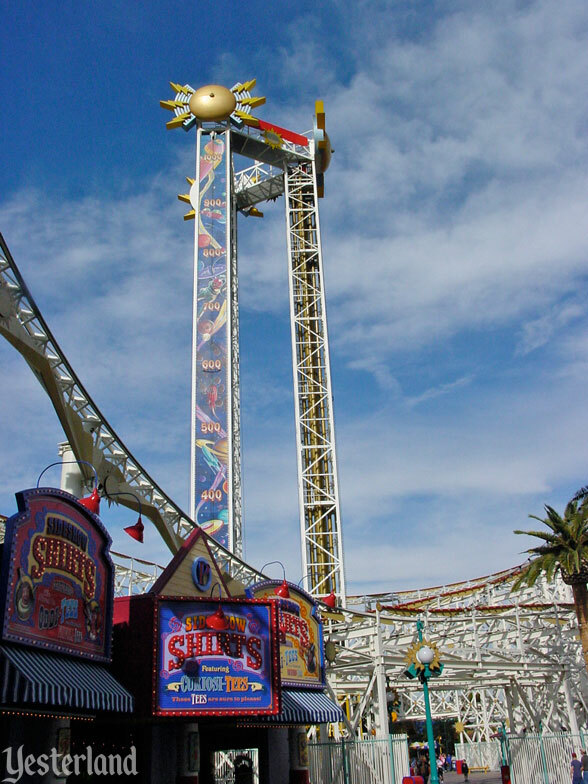 It was surprising that the decision-makers for Disney’s California Adventure chose to include an attraction that looked so similar to Supreme Scream (an S&S Turbo Drop), which opened in 1998 at nearby Knott’s Berry Farm. 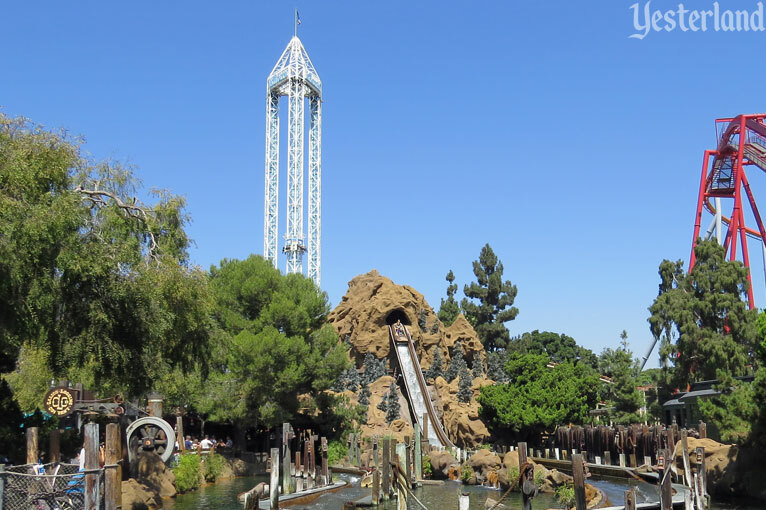 At 312 feet, with guests ascending and dropping a whopping 252 feet, Supreme Scream has bragging rights as the tallest Turbo Drop ride in the world and the tallest structure in Orange County, California. 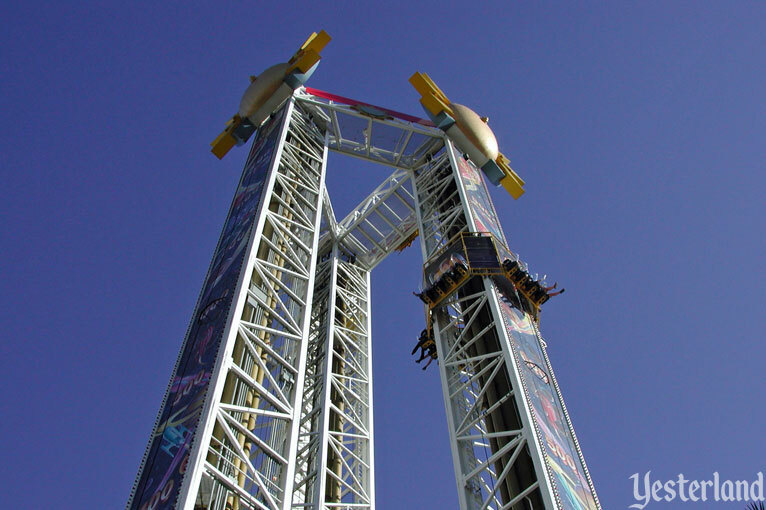 The big difference, other than the lesser height of Maliboomer, was that the biggest thrill at the Disney attraction was the high-speed ascent, while at the Knott’s attraction it’s the “beyond freefall” high-speed descent. 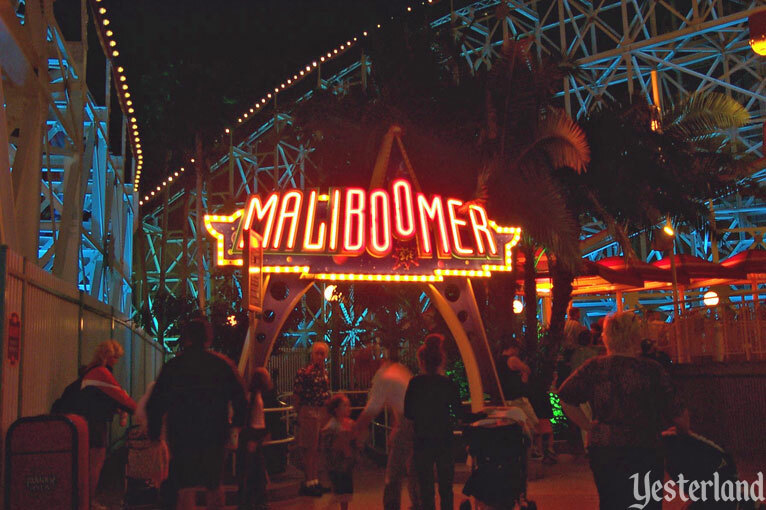 Maliboomer was a perfect example of why many Disney fans were disappointed by Disney’s California Adventure in 2001. 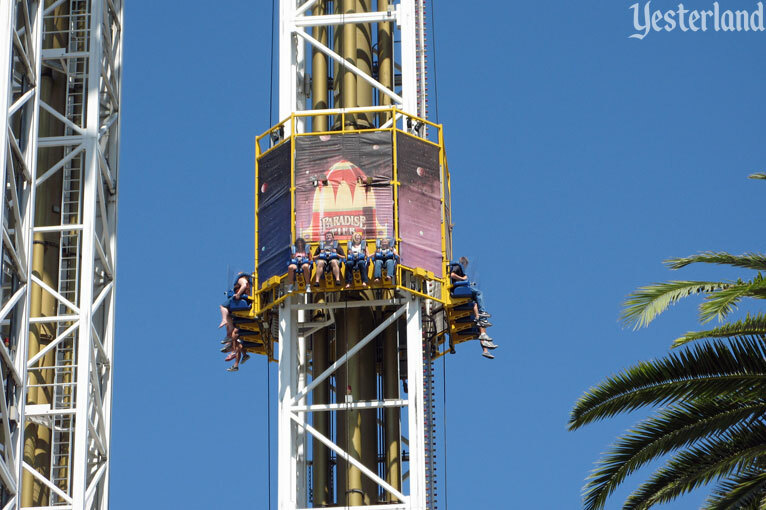 It was easy to compare two attractions that both offered thrills from fast ascents and descents: the detailed, immersive Twilight Zone Tower of Terror in Florida, and the slightly-decorated, “off the shelf” Maliboomer at the new park. Paradise Pier was supposed to take guests back to the “heyday of the great seaside amusement park piers,” but there was nothing nostalgic, authentic or charming about Maliboomer. 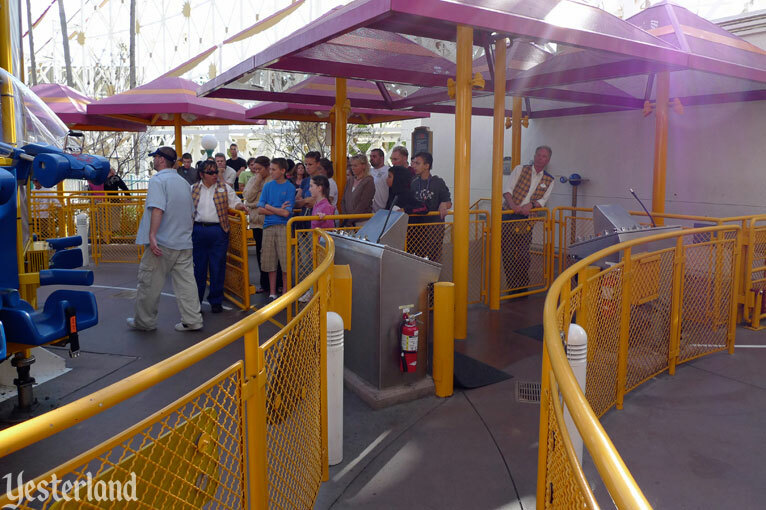 An S&S Space Shot is a decent regional park thrill ride for people who like that sort of thing—but that’s all it is. In May 2004, the California park got its own Twilight Zone Tower of Terror. Although not as detailed as the Florida original, the difference between Maliboomer and the new thrill tower was night and day. 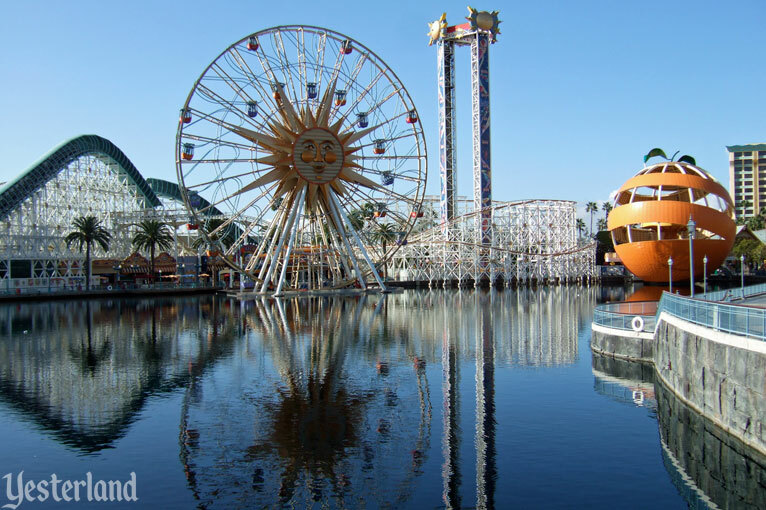 In late 2007, Disney announced a $1.1-billion makeover for California Adventure. 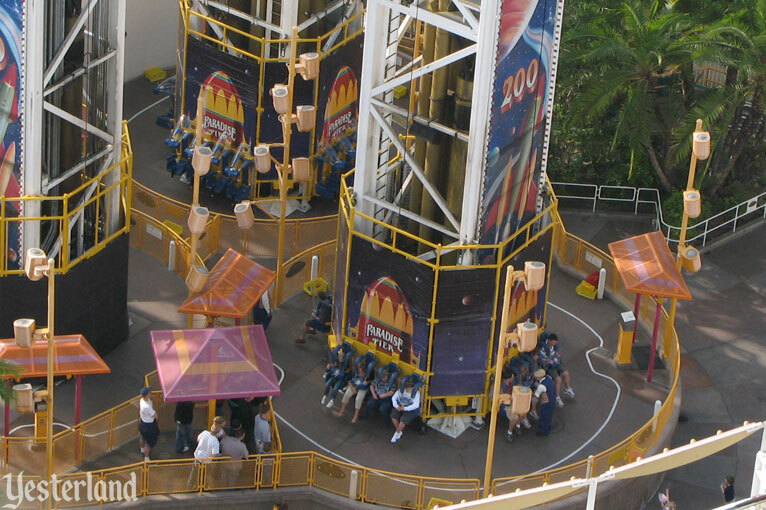 Maliboomer was conspicuously absent from any drawings, models, or maps showing plans for the revamped park. Its neighbors, Sun Wheel and Orange Stinger, were given a strong infusion of charm and Disney theming, with great results. And Maliboomer could be dismantled and sold to another park somewhere in the world (although its new location seems to be a secret). 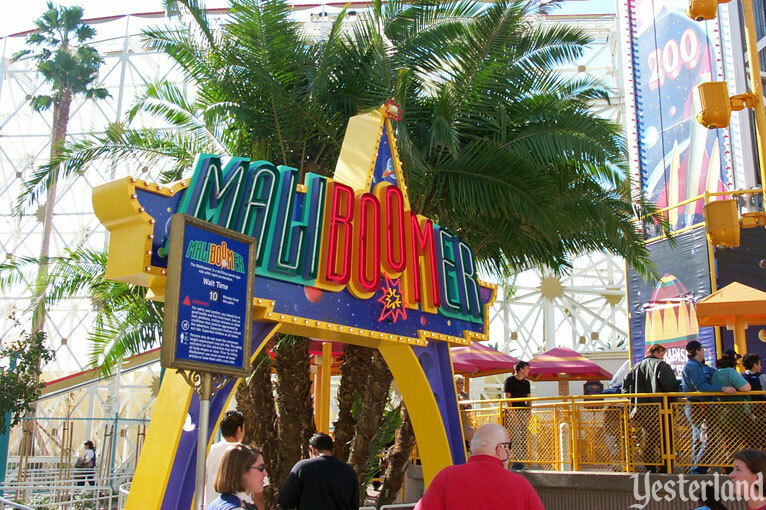 Maliboomer closed permanently on September 7, 2010. 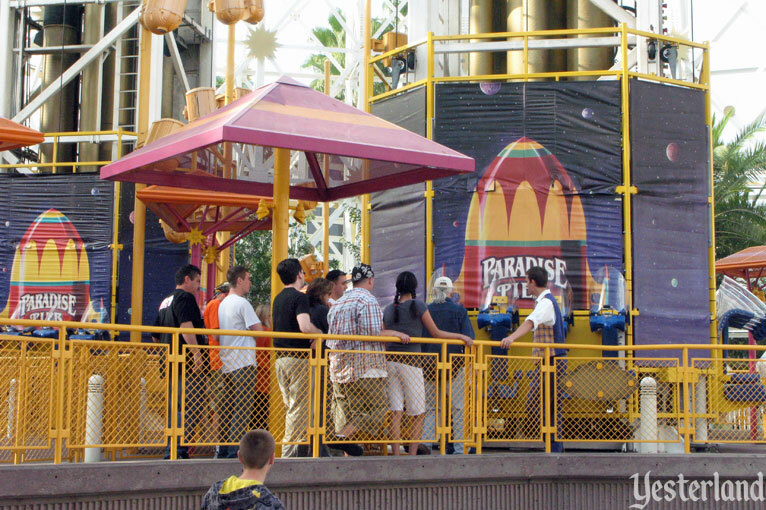 With Maliboomer and its 1990s technology gone, Paradise Pier arguably looked much better, especially from across Paradise Bay. Above the graceful curves of California Screamin’, the monumental yet friendly Mickey’s Fun Wheel dominates the Paradise Pier skyline. Although the towers were dismantled in October 2010, nothing has replaced them yet. Remnants of Maliboomer remain at ground level, including the concrete pad and railings. The path around Paradise Bay goes by them. The area is not entirely dead. One part has been used for character greetings and photo opportunities. 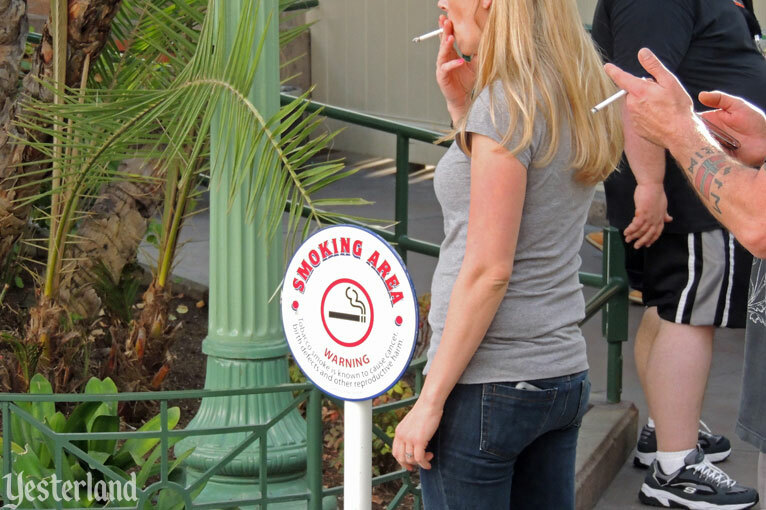 Another part has served as a designated smoking area. 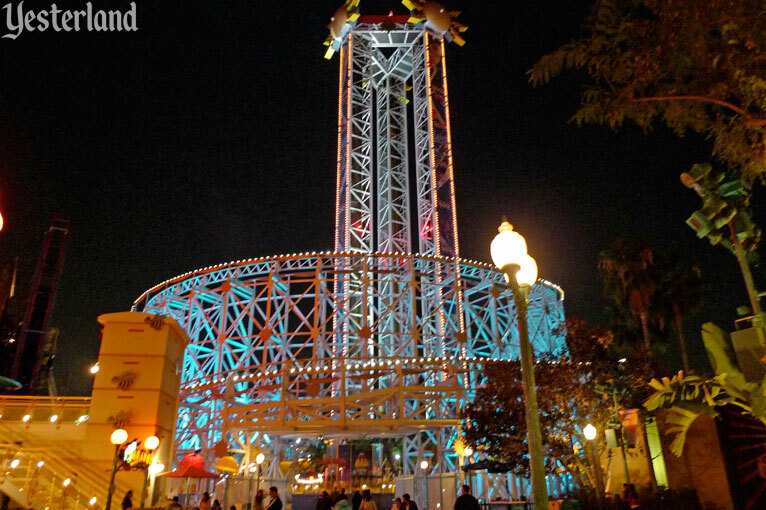 And there’s still the dynamic energy of the California Screamin’ coaster trains. It’s valuable real estate. Something new is overdue. 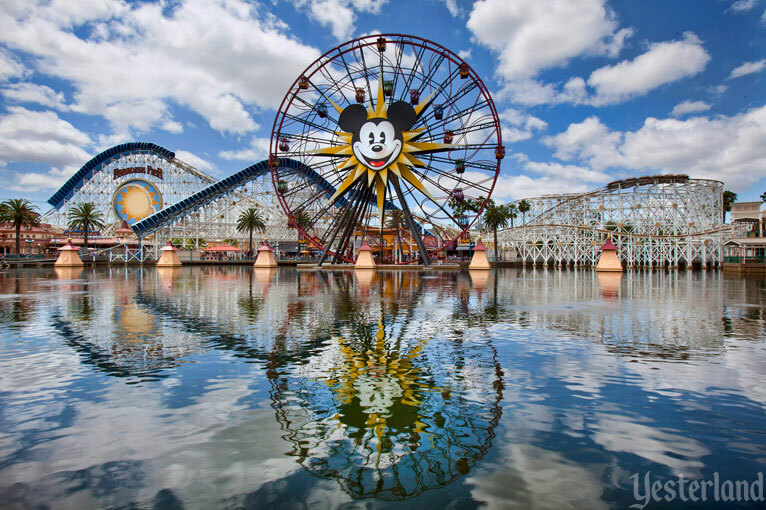 On July 15, 2017, at D23 Expo in Anaheim, Bob Chapek, Chairman of Walt Disney Parks & Resorts, announced that Paradise Pier would become Pixar Pier. 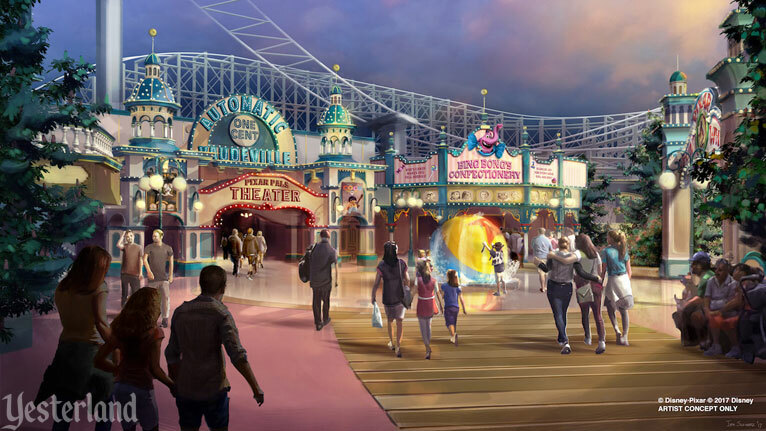 Concept art showed a continuation of the design aesthetic from Toy Story Midway Mania and Boardwalk Pizza and Pasta. Everything is Pixar character-themed. Pixar Fun Wheel is at the far right (if you read the sign carefully), signaling another change to Mickey’s Fun Wheel. The center of the art, behind Bing Bong’s Confectionary, is where Maliboomer had been. It seems the former site of Maliboomer has a bright future.